Acai (pronounced ah-sah-eee) bowls and smoothies have been gaining in popularity for a few years now, but I’m only just now jumping onto this superfood bandwagon. Up until recently it felt like acai puree was an exotic specialty food that wasn’t easily available to me, and as you may know, I’m not usually the type to seek out specialty ingredients. My specialty is making recipes from ingredients you already have in your fridge or pantry. However, all of that has changed now I can find organic unsweetened acai puree packets at Trader Joe’s. 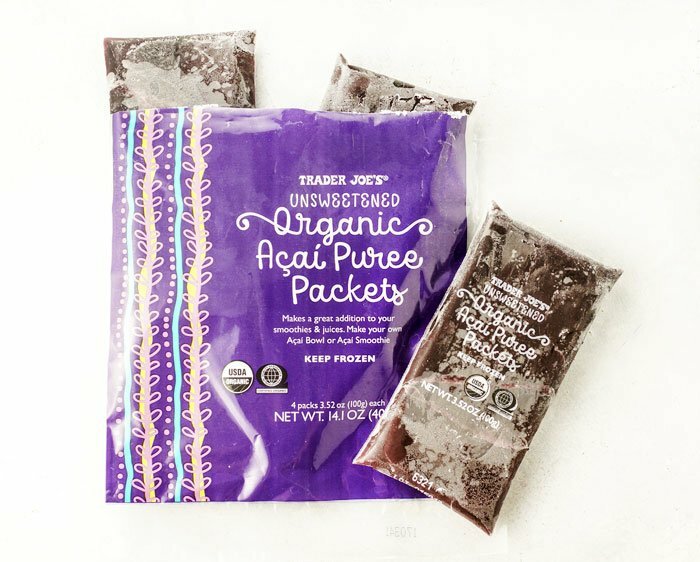 If you don’t have a Trader Joe’s near you, I’ve also seen acai puree packets in the freezer section at Whole Foods and even some traditional grocery stores, if you’re inclined to give them a try. Why is acai good for you? It is thought to have more antioxidants than any other fruit. It contains medium chain fatty acids, including oleic acid (omega-6) and linoleic acid (omega-9 fatty acids), which are thought to reduce LDL cholesterol and raise HDL cholesterol. These healthy fats promote both heart and skin health. It contains important minerals, including potassium, iron, and magnesium. Potassium is important for maintaining healthy blood pressure levels. It contains plant compounds that are thought to be anti-aging, anti-inflammatory, and anti-cancer by protecting the body from free radical damage. What really sold me on this acai smoothie is how much my 3-year-old son loves it! The first time I made it, he drank a full 16-ounce cup of this smoothie, and then asked me to make him another one. I can’t remember the last time he did that. Perhaps it’s the creaminess that the acai adds to this smoothie? 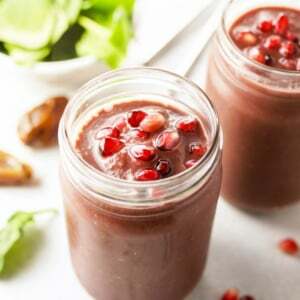 Because of its healthy fat content, I’ve noticed that this smoothie seems creamier than a typical fruit smoothie, as if you’ve added a bit of avocado or full-fat coconut milk to it. I hope you’ll enjoy this cold and creamy shake as much as we do. Since it’s dairy-free, that makes it vegan and paleo friendly, too! This is the BEST acai smoothie recipe! 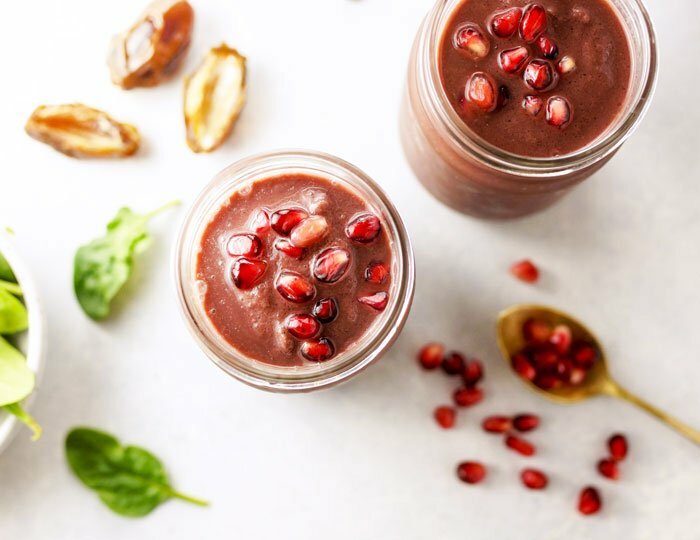 Using Trader Joe's affordable organic unsweetened acai packets, this healthy smoothie is quick, easy, vegan and paleo. To open the frozen pouch of acai puree, run it under warm water for 10 seconds. You should feel the puree loosen enough to break it up into chunks and will easily be able to open the bag with scissors. 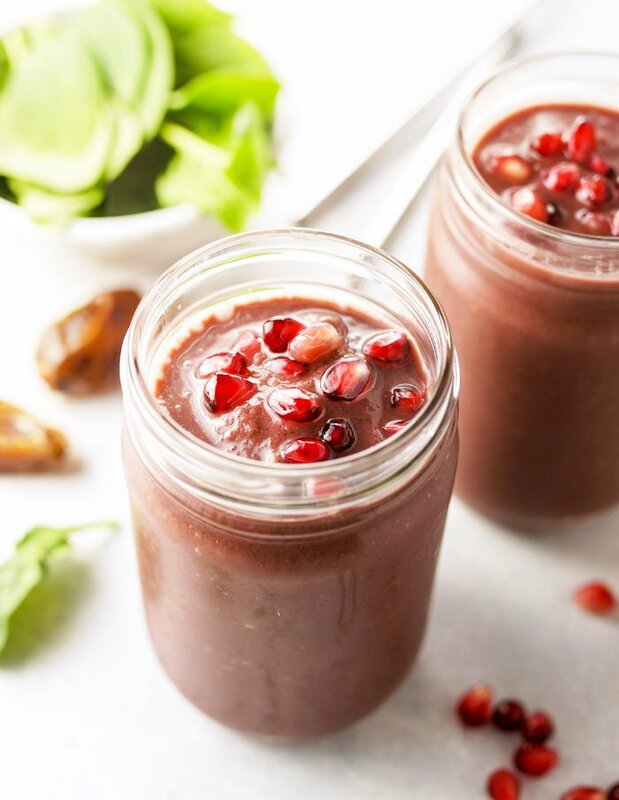 In a high-speed blender, combine the acai puree, dates, orange juice, water, frozen mango, and spinach and blend until completely smooth. If you'd like a thicker shake, feel free to add a handful of ice cubes and blend again until your desired texture is achieved. Serve immediately. When I run out of my acai packets, I’ve successfully fooled my son by substituting roughly 1 cup of frozen wild blueberries to replace the acai packet. (I think acai tastes very similar to wild blueberries.) You may want to add 1/4 of an avocado when making this substitution to make up for the creaminess that acai provides, which will also leave you feeling satisfied longer. If you’d prefer to skip the orange juice, I like to add a tablespoon of freshly squeezed lemon juice to balance out the sweetness of this smoothie, then make up the rest of the difference with water. As always, if you make any other substitutions, please let us know in the comments below so that we can all benefit from your experience. Reader Feedback: Have you caught on to the acai berry trend yet? If so, what’s your favorite way to use it? Agree 100%. I just found açaí unsweetened organic packets at Target; 4 for $6. I mix it in a blender with a table spoon of raw local honey (mine; i have bees), organic berries and water. It’s my new breakfast! I’m vegetarian so this along with plant based pastas and brussel sprouts or spinach and salads makes up my basic diet. Water with a splash of lemon juice might be nice? I threw in a pealed orange instead of the orange juice. It was tasty! Hi, Megan really love your recipes, I have one question maybe you like to answer !! Can I use fresh berries rather than the power form? I don’t see why not! I can only find them as the frozen puree, but I imagine the whole berries would work fine, too. We’ve made this several times. Love it! I don’t have the packet puree but have the powder Acai. Can I substitute that and how much powder do you think? You mentioned the healthy fat content in this smoothie making it creamy. Where is the fat coming from? Oh. Never mind. I just looked at the acai package. Surprised there’s fat in there! I know, it’s weird! The first time I tried it, my smoothie had the same texture as if I had blended an avocado into it! Love this smoothie! It’s perfect for summer! So creamy and delicious! I’ve made this three days in a row ? Your acai smoothie will certainly dress up my tired spinach smoothies. I am sitting here, with my feet in a detox foot bath, and looking for new healthy recipes. Your website certainly fit the bill for someone who is currently detoxing. ??? Thank you for including a way to introduce acai to my daily smoothies! Your pictures are spectacular and make the smoothie look fantastic! I like most of the ingredients in the acai smoothie, but do not like mango, what do you think is a good substitute for mango? Love your Everyday cookbook. You could try frozen peaches! I don’t like mango either, but for some reason, in small amounts in smoothies they don’t bother me. However, in other smoothies I’ve found peaches to be a good sub.